I have entered a new phase of my life, the running phase. After 60+ years of not running, I signed up for a Couch to 5K program at Fitchburg State. The program is designed for non-runners, like me, who want to learn how to run. We meet once a week in the rec center with a trainer (Chuck) and run on the track. The first week was tough, but exhilarating, and it has been that way ever since. Every week (and I am now in Week 4!!! ), the run times get longer. But it is always interval training: run 1 minute, walk 30 seconds, etc. This week it is walk 5 min, run 3 min, walk 90 secs, run 5 min, walk 2.5 min, run 3 min/walk 90 sec, run 5 min, cool down walk 5 min. I did it, twice in fact. Each week, I have discovered something new about running and about myself. I was really nervous about week 3, when we ran for 3 minutes, but I did it. And this week, 5 minutes without stopping. As with everything I do, gear helps. Chuck advised us all about proper running shoes on Day 1: Asics. 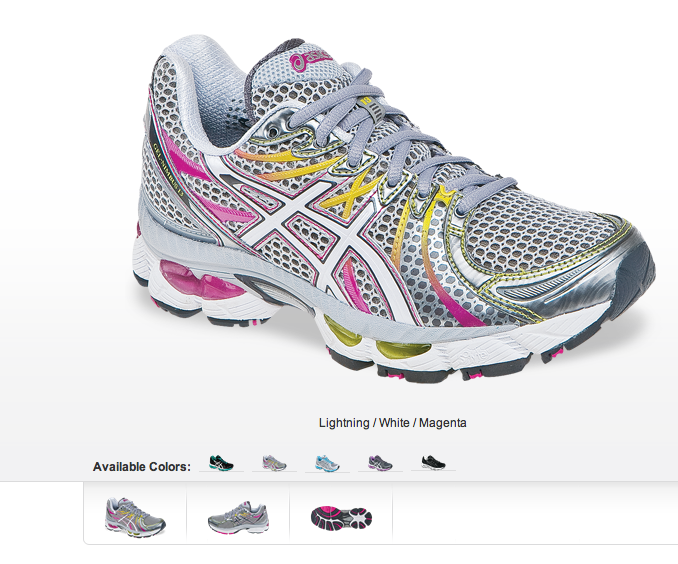 So I went online and found the right style for my feet (Gel Nimbus 13, with lots of gel and arch support). They came from Zappos overnight! I put them on and ran in them without any problems. Comfortable, great, and, of course, gorgeous!!! So now I am into this program and am determined to continue all the way to 5K (April 29). I've found a variety of apps for my iPhone to help me with this (timekeeping is tricky), and am searching through my music library for inspiring and upbeat music (Santana) to help me keep my pace up. This is actually fun and I give it five stars. I never would have dreamed that I would do this, much less keep it up for a month, three times a week. But I have, and I will. Hooray for me! I'll keep y'all posted on my progress.